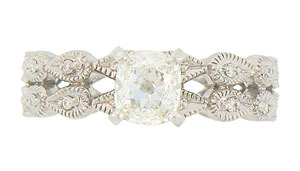 An exquisite GIA certified, .75 carat G color, Si1 clarity, cushion cut diamond floats above the surface of this antique style engagement ring. 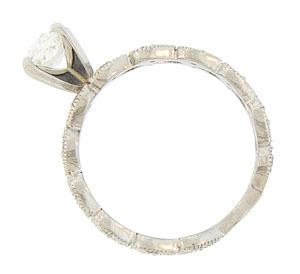 Two bands of teardrop figures, each set with a round faceted diamond encircle the surface of the ring. The bold figures are engraved with linear rays bringing additional attention to the diamonds set inside them. 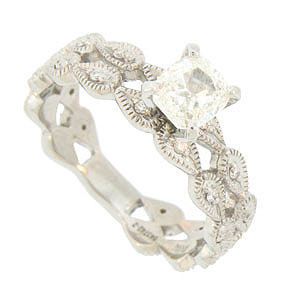 This stunning wedding ring is crafted of 14K white gold and measures 5.97 mm in width. Size 6 1/4. We can re-size slightly.